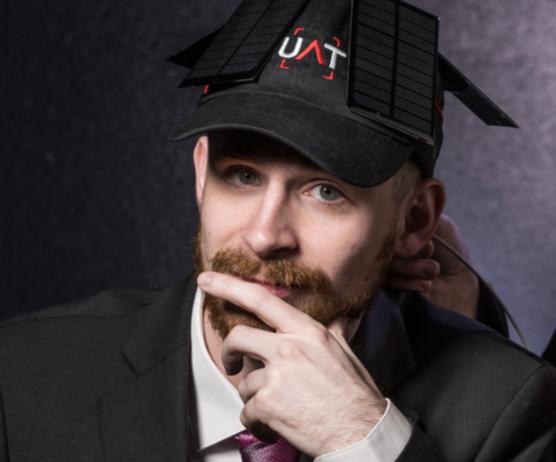 The University of Advanced Technology—one of the most innovative information technology / cyber security degrees colleges in the country—can give a wave of the cap to the earth through a new, solar-powered hat developed by two UAT students. The prototype "Solarcap" was developed through the technology university training brought to UAT alumni Jennifer Talin and Ethan Klees. As Jennifer explains it, the light of inspiration came to her on vacation. "I was in Yosemite on Spring Break," Jennifer explains. "It was really sunny, my phone was dying and I was like man, I wish I had solar panels or something to be able to charge my phone. It would be annoying to carry around solar panels, so why don't I put solar panels on a hat and then have it charge my phone? We came up with a way to do that and it works too, which is great." Jennifer and her partner, Ethan, relied on their Business Technology studies to create the Solarcap prototype. Weighing in at just under a pound, the Solarcap has a bank of solar panels that will allow wearers to charge electronic devices while they're on the go. The attached power bank in the back of the hat can be removed so the hat can be washed or just worn separately; additionally, the hat's attached, portable battery offers a constant charge for wearers wherever they go. As one of the most comprehensive and career-oriented technology colleges in the country, UAT had well-prepared the two for their creation. The curriculum training at UAT enabled Ethan and Jennifer to do all the back-end work and develop a go-to-market business plan. Their plans show that the Solarcap could be created for as little as $10 per unit and sold for five or six times that in stores; the two are looking at marketing the product to camping-equipment stores and possibly creating a company to sell the Solarcap. Jennifer and Ethan don't plan to stop tweaking the design. They are constantly exploring new options for the Solarcap, everything from waterproofing to adding easy-removal options for the wash. Their goal is to make the Solarcap a vital part of a green movement. "Our goal is to reduce our carbon footprint, which means that using the sun is better than using an outlet," Jennifer says. "It's a renewable power source, and I think that renewable energy is where we are headed. We're trying to start in the fashion industry."